The heart and lungs begin to form. Your baby is just a tiny embryo at this stage. All the baby’s major body organs are beginning to develop. The ears, fingers and toes are also beginning to form. 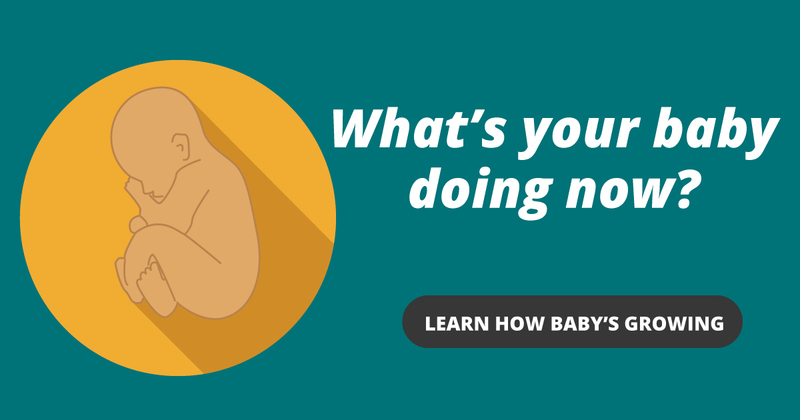 At the six-week mark, you may be able to hear the baby's heartbeat during an ultrasound. By the end of the second month, the baby is about an inch long. Soft nails are beginning to form on the fingers and toes. Tiny buds have appeared that will later become baby teeth. By the end of this month, the baby is about 3 inches long and weighs about an ounce. The baby moves, kicks, swallows and can hear. By the end of the fourth month, the baby is around 6 inches long and weighs about 4 ounces. The baby now sleeps and wakes at regular intervals, and his or her skin is covered with fine, soft hair. At the end of this month, the baby is about 10 inches long and weighs around 1 pound. At this stage, the lungs still aren't ready for life outside the womb. By the end of the sixth month, the baby is about 12 inches long. Responsive to light and sound, the baby can now open and close his or her eyes. Moms may notice a lot of activity in the womb as the baby kicks and stretches. Your baby is gaining weight rapidly. By the end of the eighth month, the baby is about 14 to 18 inches long and weighs around 4 to 5 pounds. Halfway through the month your baby will be full-term. To get ready for birth, the baby will usually turn head down and move down into the pelvic area. HOW WILL YOU KNOW YOU’RE IN LABOR?